I love being self-employed but one of the major drawbacks is when I get sick, I go into a slight panic mode. I’ve mentioned I’m the type of girl that wings it most days (which also means, I don’t schedule out blog post very far in advance.) 90% of the time, this isn’t a problem until I get sick and can’t even think about stepping foot in the kitchen (which happened last week and why it’s been so quiet on the blog/social media). 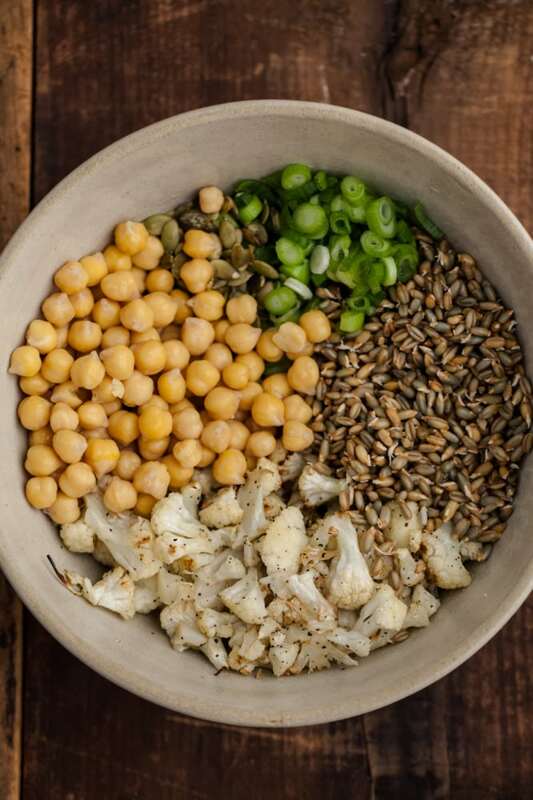 This little bowl is another thrown together recipe (I think where I’m headed for every meal.) 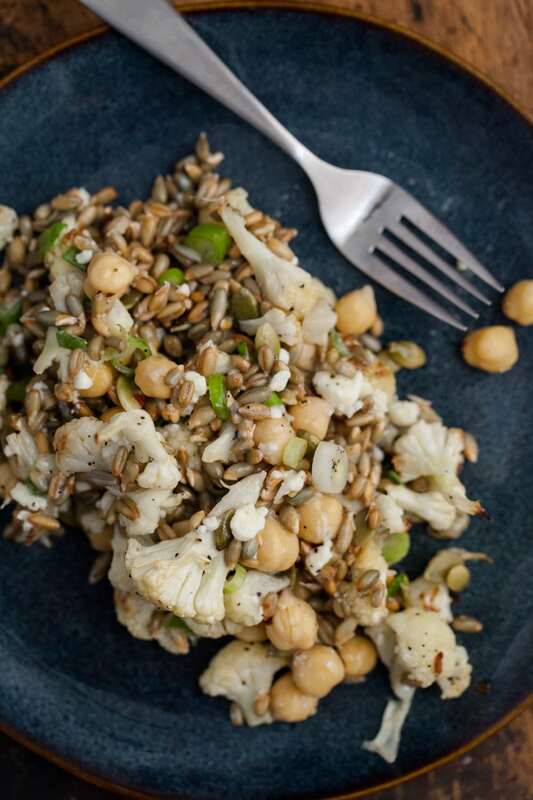 I’ve been working a lot with sprouted grains and beans, finding which flavors I like the best and sprouted rye berries has quickly become a favorite. Rye has a unique flavor and once sprouted, the flavor is a bit muted, but still very unique. I ate this salad for lunch for a few days in a row and the flavor was better each day. Of course, if rye berries aren’t your thing, any type of sprouted grain would work (or cooked grain for that matter.) I think next time I’ll plan ahead and sprout the chickpeas as well! Preheat oven to 400˚. Toss cauliflower with olive oil, salt, and pepper. Spread into a single layer on a baking tray and roast until tender and lightly charring, 30-40 minutes. 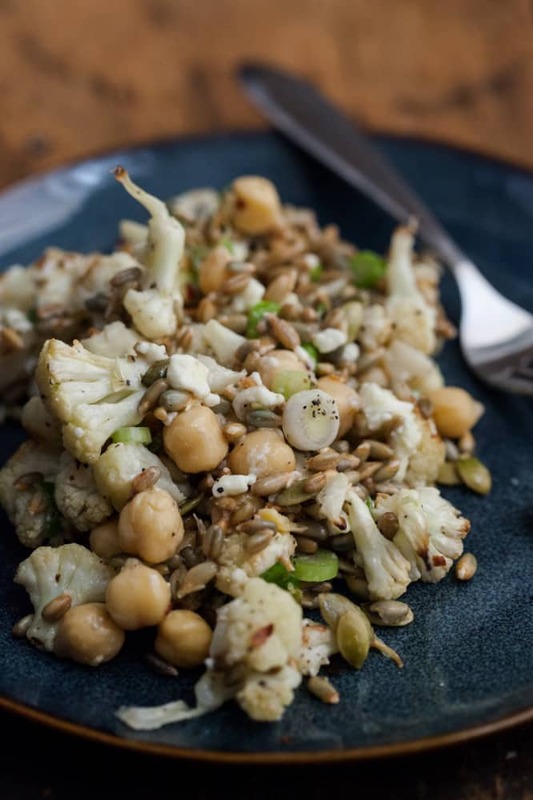 In a bowl, combine the rye berries, roasted cauliflower, chickpeas, pepitas, green onions, and feta. Drizzle olive oil and lemon juice over and toss until combined. Taste and adjust seasonings as desired. Love love love roasted califlower. There’s really nothing better. Glad you are feeling better too! Thanks for sharing I haven’t worked with eye berries but will check this out next time I go to whole foods!! I haven’t tried rye berries before. Looking forward to grabbing some next time I’m at Whole Foods. This bowl sounds delicious. Glad you are feeling better! That looks so good! And sounds fairly easy to make 🙂 Thanks for sharing! I’ve never even heard of rye berries before! I’ll have to check them out. 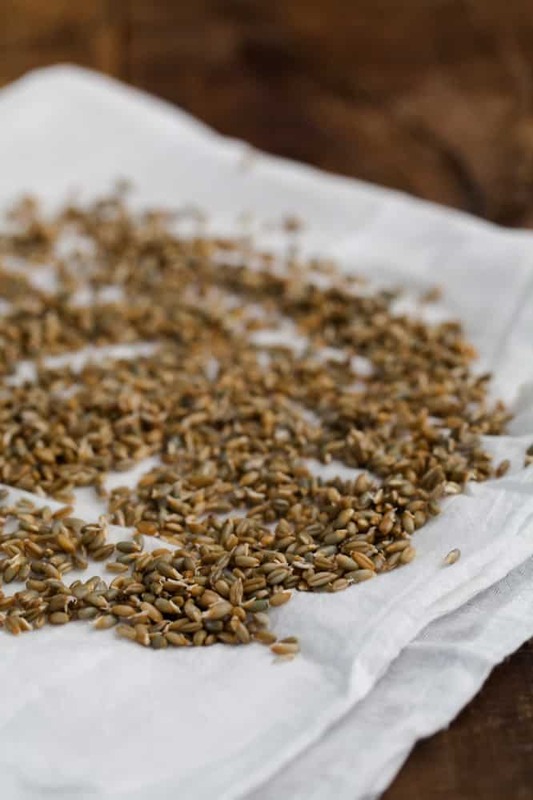 Do you have a preferred method for sprouting your grains? I know I should be eating more but every time I try to sprout grains I end up with a slimy mess. This sounds like a wonderful combination of earthy flavors. 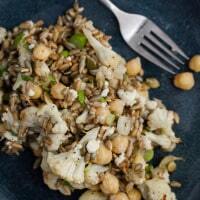 It certainly makes me want to give sprouted rye berries a try! This looks amazing erin! I’ve never tried cooking with rye berries so I must check them out asap! Another amazing recipe! This will be on my plate tonight. Is rye gluten free though? Thank you! I will be trying this tonight. I have a mini goal of trying a new ingredient every couple week, learning a few different ways to use it. I was inspired to do this by your site which makes it so easy! I was at my local health food shop and they had grain bag in a row and I closed my eyes and pick one. Definitely trying this Rye Berry recipe first. I made this for lunch today and it was fantastic. I used lime instead of lemon, and added some red capsicum and cucumber (because that’s what I had), and I will definitely be having it for lunch again tomorrow.